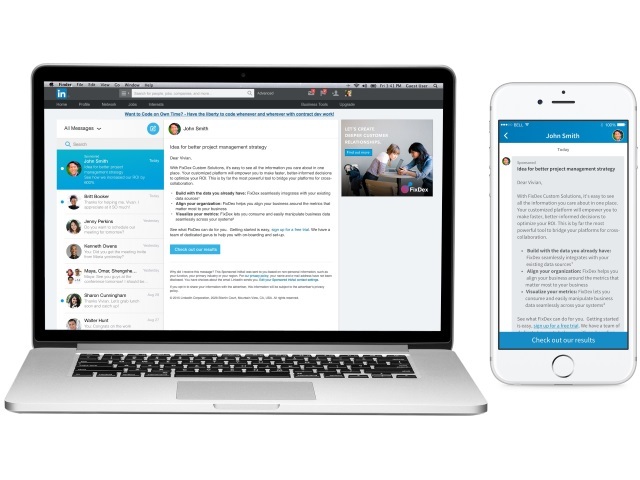 LinkedIn announced Wednesday that Sponsored InMail is now available to all advertisers via its Campaign Manager. Sponsored InMail joins Sponsored Content and text ads as self-serve advertising products that can be created via Campaign Manager. Personalize your outreach to prospects: Sponsored InMail is a great channel for marketers to easily craft relevant messages without restrictive character counts. Drive conversions with mobile-optimized features: Generate leads with a persistent call-to-action button on mobile and desktop. And our responsive design ensures your message looks great on any screen, large or small. Reach members when they’re most engaged: With real-time delivery, Sponsored InMail messages are only delivered when members are active on LinkedIn. And strict limits on how often LinkedIn members can receive InMail ensures that your message gets maximum mindshare. LinkedIn added in an email to SocialTimes that some 100 advertisers participated in a pilot program of self-service Sponsored InMail prior to the feature’s release Wednesday, and they saw open rates of about 45 percent and click-through rates of 4 percent to 7 percent. Readers: What are your thoughts on this move by LinkedIn?